I thought it time I revisited the mini sites topic again as it did generate some interest last time I talked about them and I feel I need to clear up a few questions of importance. A. The initial reasoning for mini sites for many people is to find a use for domains likely already held but not used, many developers have lots of domains that are always on the to do list and never got round to so a mini site is a quick and practical use for a domain you already own. Also a mini site should tackle one specific topic and cover it well with good content, this lends itself better to being put on a single domain for credibility rather than a spammy looking site with random topics/design and no obvious thought process. At the end of the day a really good mini site should be able to hold its own and if the content is good then it may also get natural links. Lastly the idea behind a mini site is a very small or single page website that can be prepared and published and then left alone, sure you need to try and get a couple of backlinks to it either from other websites you own or from possibly one overall main website that links to your mini sites to get them spidered by the engines and listed but after that it should be a done deal. Q. Where do you get unique content, I can’t write about lots of subjects in depth myself! This type of mini site would focus on a product, perhaps with affiliate sales in mind, I have never tried this type, it would likely need to be funny/catchy or inspirational so that it caught the attention of users from the likes of Stumbleupon to create traffic, just putting up affiliate links would blend into the abyss and would never get any traffic. An information based mini site would take text, say an essay on a particular topic or subject, if you do a Google search for ‘buy student essays’ you’ll find sites that not only sell unique content, they sell content that has been well researched and written unlike the average type of $10 content you can buy from many forums. This type of mini site then looks to pick up traffic from long tail keywords, namely long search terms & phrases. Without lots of work and promotion you’ll never rank for a term like “homeschooling” which has 7 million results, however you may well rank with a suitable essay/article for a term more like “how to teach my own children at home” type of phrases, they are long tail keywords and in an internet age where searchers are smarter than ever before more people will type what they really want without being vague thus increasing the value of long tail search terms. By far the best method is a tool or calculator, these are so viral and people link to them freely if they are well thought out and considered but in my case they may take more of an initial outlay than any other method. An example as mentioned before is Tattoo Fonts, a single page site that lets you see text in a variety of fonts, I believe windows only allows you to install so many fonts, either way its a hassle to the people who are not computer savvy so a page like this is ideal for some tattoo enthusiasts to look for a funky font for text they may want to integrate into a tatt. In this instance I posted a request on Digital Point and who should answer my plea? yep my friend Al (before I knew him) and he got me the script for that one as a freebie! More recently I found one of my bits of paper with ideas as I often jot down things down on bits of paper all over the place and I have had many requests for stencils from the translations that I do and at times some stroppy emails about lack of stencils, its not a design service though just a translation one, I do know that in my Paint Shop Pro image program that I use I can convert simple images to stencils, so my first thought is ..hmm I could offer that as an extra service, an extra $1 for a stencil as well. However I do a fair few translations and I am happy with the service as is but I’d like to offer that facility online so it could make a great mini site tool! Still working on it but it is another single page site that hopefully people will like and use and link to and I can then look to monetise later on, people love tools and calculators, it isn’t always easy finding inspiration and to be fair that is the only hard part of work you need here – to listen, read and think of the ideal tools. Even if you can’t code like me then you can get them made for a reasonable fee. Now how do you value a site like that? A mini site generating 30k visitors per month would almost be valued in the same way as type in traffic to me, gold dust for zero maintenance, hopefully the tracer script can be perfected and do as well in the coming year or so. The best mini site isn’t a con, it is not made for adsense, if you take that extra time at the start to make sure the content is good or the tool is useful even if there is a small initial outlay you can strike gold and find that mini sites indeed do not have to make mini money. A good entrepreneur listens differently to the world around them, looking for opportunity where others find inconvenience and then they take action! (real example) My house had vibrating pipes when the hot water was run, found the solution and created a mini site with the info on it! For a good outline on how to make a mini site from scratch Ash posted a good writeup for your enjoyment. From now on look for complaints, look for and listen to people moaning as they may very well provide the very inspiration you need. Two of my best mini-site examples related to Damp, Mould and Mildew and the other relates to Chancel Repair liabilities. One article i blagged from a writer friend and the other i researched and compiled myself. Excellent follow up Scott. Since you’re last post I have been fascinated by the idea of mini sites, but the idea is indeed the problem. Your example of fixing the pipes at your house finally rang the bell in my head because we are surrounded by this type of thing. We do this type of research all the time…why not compile what you’ve learned and create a page. Thanks. Thanks Ryan, the strangest of events can lead to inspiration at times! Great article. It seems like such simple information, but it’s not obvious at all to a newcomer like myself. Thanks for the info. I’ll have to dive in myself. Great Post. Very well thought out and researched. I have a question in how long you generally spend building your mini site, and how much time you invest in maintanance one it is up and running? Cheers Scott, if it is a tool like TattooTracer then I post it on a site for a coder to bid/make and from initial idea to up and running beta was one week. Text info mini sites usually take 10 minutes to create from an indea so usually have to wait for the new domain to resolve if its a brand new domain reg’d for the purpose. Once up and runnning zero time should be needed, I spend no maintenance time on them hence you then have an unlimited amount of mini sites that you could own. What do you think of an automatic updating blog? Would it be considered a good idea? I am using it for http://www.bmw-hydrogen-7.info/ and it’s updating from a relevent place. As long as it isn’t duplicate content Abdul, if its duplicate your unlikely to get much joy from it. Looks like duplicate content to me, and i doubt you;ll get much joy. A much better use of your time spent setting up a site like that would be to write even one unique article and get it uploaded. I have only just seen this website. Having one article doesn’t sound appealing ot me becuase I know that I won’t have a large returning visitor %. A very interesting and useful post. I’ll definitely look into this minisite thing which i considered spam till now. Another mini-site type you can add to the list is “Youtube video” sites. 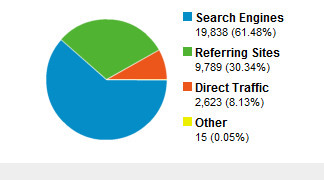 How many searches a month should the keyword for the mini-site have? I assume you do use some sort of keyword research tool. A combination of the above should tell you if its worth pursuing. but I’m still breaking even after a year. Love the article. Is there a reason you aren’t using a live ebay feed for the magnets refered to in the vibrating pipes site? Just wondering. To be honest Stone I have never done much in the way of aff. sales before so it’s a learning curve for me, it is something I will be doing a fair bit of in 2008 though all being well. I’m fairly new to this myself, too and am in the early stages of getting things going. Just an FYI Ebay will provide you code to paste on your site for your specific product. It will show the most current auctions and bids. I don’t know what kind of results you would have but it could be a possible revenue stream for you. BTW, I have spent the better part of yesterday afternoon and this morning going through the blog and have thouroughly enjoyed it. I am at a point that I am just now “getting” the whole internet marketing thing and this blog has really tied some loose ends for me and opened my eyes to some ideas too. Thanks. good explanation, i read till end. Hey Rich, I think you may be right in that it’s a bit of a hard keyword/phrase to target. If I was to do a mini site calculator I’d go further down the list for a first attempt and try something like ‘retirement calculator’ it has very high CPC and avoiding mortgages & savings reduces the competitiveness enough to give you a better chance of success.